There will never be a final version of your website. No website should ever stop updating. You might think it has the perfect layout, but don’t be afraid to change it! Change is good, and brings more traffic to your site. 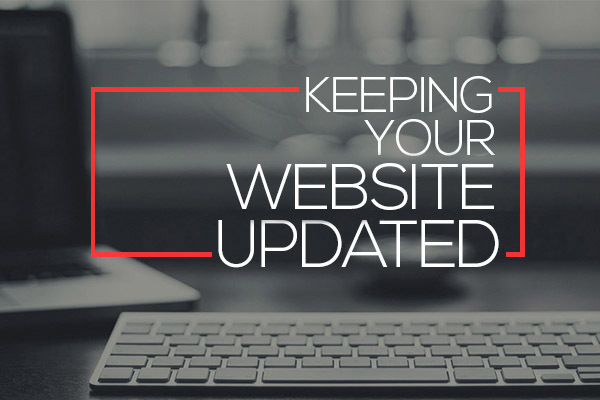 Whether you maintain your own site, or belong to a company that maintains their own site, updating should be something that is always on the agenda. Why is new content important? When new content is added to your website, it engages consumers and causes them to stay on your page for longer amounts of time. This, in turn, will affect your bounce rate – or the rate at which viewers bounce off your website after the first page. You want that rate to be as low as possible! Remember, your viewers want to learn something new in their visits to your page, but if it never updates, they’re more likely to bounce off your page quickly (causing your bounce rate to increase). Content also needs to be current. That way, consumers will begin to rely on you for trustworthy information. If blogs are never new, or information is old, consumers will question whether or not you are still in business! Keep that information up to date, and your visitors will be coming back for more! Why is design important? Visitors see your website as a reflection of your business. A professional looking website gives you authority and you are seen as an expert. It is also imperative that they are mobile friendly. These days, over 60% of web traffic comes from mobile devices. If your website is not easy to read from a mobile device, or doesn’t respond well, your consumer will look elsewhere! Also, a call-to-action is a MUST! Convert those visitors to leads by completing an action on your landing page. So what are you waiting for? Let’s get to work on that website and increase your sales!